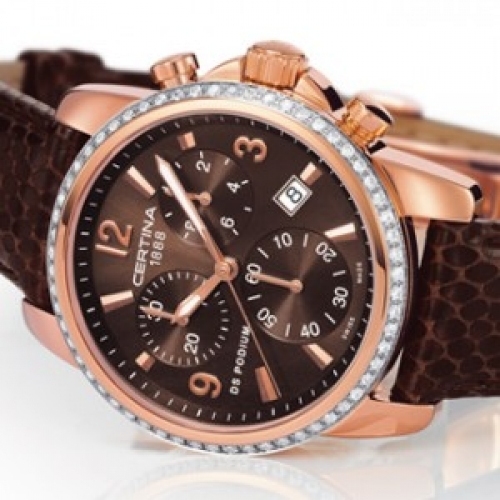 Certina's latest creation is proof that a chronograph can be feminine. Elegant and functional, the DS Podium has everything for today's active woman, who will be instantly drawn to its irresistible pink gold PVD steel case, superb sunray satin-finished chestnut-brown dial and the 60 scintillating Top Wesselton diamonds that adorn its bezel. Once again, Certina has successfully combined an avant-garde design with delicate finishing to create a sporty timepiece that will be a must for women.